In early 2018, our Pollution Limits workgroup developed a joint advocacy plan to ensure strong and coordinated outreach among Coalition members ahead of the midpoint assessment, which indicated how close we are to reaching our bay restoration goals. This included strategies on how to communicate with the public about the successes of the cleanup and ways to engage and educate local officials about the importance of clean water projects. Many of the Coalition’s members participated in the development of the plan and have already started taking action. As we enter the last phase of the cleanup, we have an opportunity to advocate for strong Phase III Watershed Implementation Plans (WIPs), which outline how Bay jurisdictions, including local governments, will achieve pollution reductions from now through 2025. As a part of the advocacy plan, the Coalition developed Engagement Guides for each state that provide our members with information and resources they need to advocate for strong WIPs. This advocacy plan builds the capacity of our members to engage in the restoration effort and helps to further our goal of returning clean water to the region. The Virginia Agricultural Cost-Share (VACS) program has distributed more than $200 million dollars to help thousands of farmers and landowners implement practices like stream exclusion fencing and forest buffers, which help prevent pollution from reaching local waterways and the Chesapeake Bay. In 2018, the Coalition’s Communications Workgroup partnered with our Virginia members to demonstrate the need for increased and sustained funding for the VACS program to the Virginia General Assembly. The workgroup identified and created materials that would be helpful in conducting educational outreach to newly elected officials, including one-pagers, before and after photos of projects, testimonials, and talking points. The workgroup also determined that a series of videos highlighting Virginia farmers utilizing the state cost-share program would help to elevate this issue. The Coalition interviewed three different farmers from strategic areas of Virginia about their experience with the VACS program and why the funding is so important. 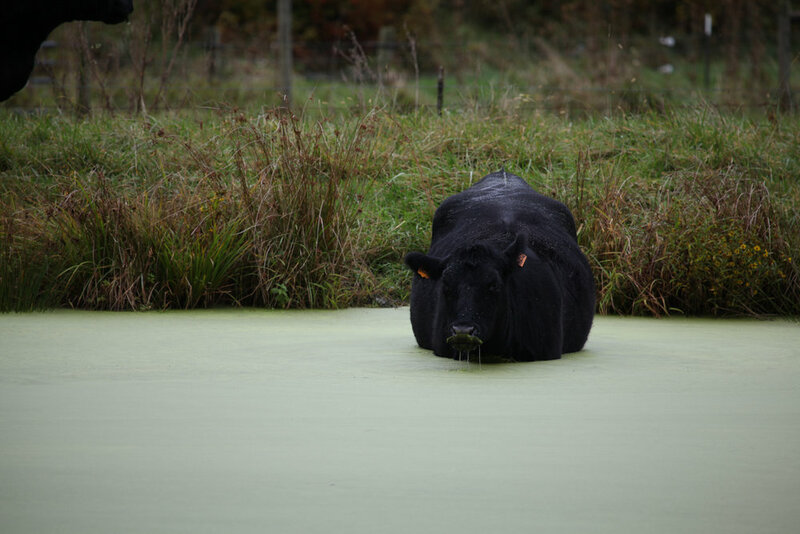 What the videos show is that farmers not only benefit economically from installing these projects, but they also understand the importance of conservation and want to protect their local waterways. A key component of ensuring that we are consistently moving the needle forward when it comes to reducing pollution is telling the story of the importance of on the ground restoration projects. This can be difficult since the projects and practices the Chesapeake community are advocating for are often confusing and jargon-filled concepts. A goal of the Coalition is to work with our members to overcome these barriers and identify ways that our community can better communicate and promote clean water projects around the watershed. To support this effort, the Coalition partnered with Maryland LCV and the MOST Center on a Stormwater Success Stories outreach campaign. Maryland LCV and MOST Center worked together to produce the “POLLUTION SOLUTIONS: Case Stories from the Chesapeake” website. This interactive site is a tool that allows users to search through more than 50 different real-life pollution reducing projects in Maryland based on location or project type. The purpose is to provide a one stop shop for visitors to access and even download information on projects that can then be used for their promotional or educational purposes. Many Coalition members have downloaded project descriptions for use in meetings with their local governments to encourage support for stormwater projects in their own communities. Knowing that members were using these one-pagers in meetings with elected officials, we wanted to ensure that we were setting our members up for success. The Coalition partnered with Maryland LCV to apply for funding from the National Fish and Wildlife Foundation to train our members on best practices when it comes to communicating about stormwater projects using these one-pagers. In September 2018, the Coalition hosted its first training with Water Words That Work and more than 20 members of the Coalition. The day-long event focused on training our members through interactive role playing exercises and provided our members with takeaways that they could use in future meetings. Many of the attendees were from Montgomery County, Maryland, where almost all of their County Council members are term limited, meaning a whole new group of council members will need to be educated on the importance of funding stormwater projects. This will be the perfect opportunity for Coalition members to execute what they have learned. In addition, the Coalition is working with members who attended the first training in September and utilizing existing meetings and forums to continue to train more Coalition members. In partnership with EarthForum of Howard County, who attended the training, the Coalition is presenting at a half-day event on communicating about stormwater success stories and Maryland LCV and Rock Creek Conservancy, who also attended the first training, will also be conducting a training at the Chesapeake Watershed Forum in November 2018. The Coalition is looking forward to seeing these new tools and skills executed in real-time in the coming months and years as we push for stronger support for these on the ground restoration projects. During this year's legislative session, the Coalition and its members in Maryland had a number of priorities, including improving the Forest Conservation Act (FCA). Between 1982 and 1997, the Chesapeake Bay watershed lost more than 750,000 acres of forestland. Today, there are about 24 million acres of forest and the watershed is losing about 70 acres each day. Maryland has not altered its FCA since 2013, which made this a priority for our members. Our state lead, Maryland League of Conservation Voters, brought together more than 15 members of the Coalition around this issue to help coordinate and strategize around how to increase pressure to pass a new version of the bill. MDLCV held weekly calls where Coalition members would volunteer their time and support for writing op-eds, sending emails to state legislators, and even organized a lobby day. In addition, the Coalition used this as an opportunity to pilot the first joint petition among Coalition members. A joint petition is when a number of groups sign their organization on to the same petition and send it out to their supporters for signing. When people see that a number of organizations are supporting a common goal, it can be much more powerful and increase signatures. This also acts as a list building campaign, where the participating organizations receive a new list of names of supporters from their fellow participants. This is something that has been done in other neighboring watershed, and the Coalition has wanted to try it in the Chesapeake. The FCA joint petition included 10 Coalition members: National Wildlife Federation, Chesapeake Bay Foundation, League of Conservation Voters, Alliance for the Chesapeake Bay, Potomac Conservancy, Blue Water Baltimore, Clean Water Action, Maryland League of Conservation Voters, South River Federation, and Severn River Association. These organizations were selected due to their varying sizes, location, capacity, and member lists. After running the joint petition for a little over two weeks, the group received more than 3,700 signatures, and all participating organizations received new names to their lists. In the end, the FCA did not pass this time, but the Coalition considers our effort a success. The ability for these different groups to come together and strategically work on a common issue and conduct a joint petition is something that would not have been possible without the framework of the Coalition. Our members will be ready to take up the banner once again in 2019! 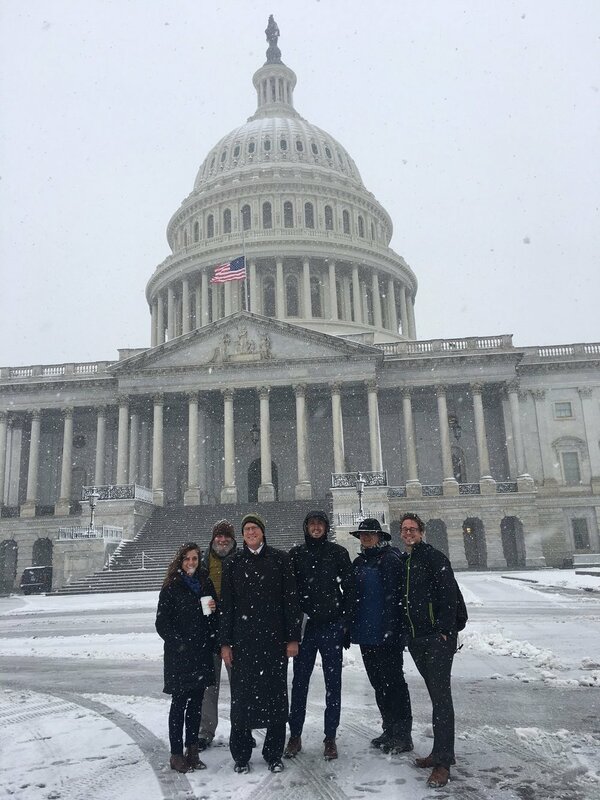 On March 21, more than 100 members of the Choose Clean Water Coalition and the Coalition for the Delaware River Watershed fought through a snowstorm to speak with their members of Congress about the importance of clean water. This was the 6th annual Chesapeake Bay Day on Capitol Hill for Choose Clean Water, a coalition of 239 nonprofit organizations focused on restoring and protecting clean water in the Chesapeake Bay watershed. Despite the snow, the Coalition met with more than 20 members of Congress to discuss federal threats, like funding cuts to the Chesapeake Bay Program. Coalition members also had the pleasure of hearing from 10 different members of Congress at the Chesapeake Bay luncheon, including Senator Chris Van Hollen (D-MD), Congressman John Faso (R-NY), Congresman Dutch Ruppersberger (D-MD), Congressman Jamie Raskin (D-MD), Congressman Rob Wittman (R-VA), Congressman Bobby Scott (D-VA), Congressman Don McEachin (D-VA), Congressman Don Beyer (D-VA), Congresswoman Barbara Comstock (R-VA), Congressman Gerry Connolly (D-VA). The legislators spoke about life around the Chesapeake, where to find the best crab cakes, and of the future of clean water. 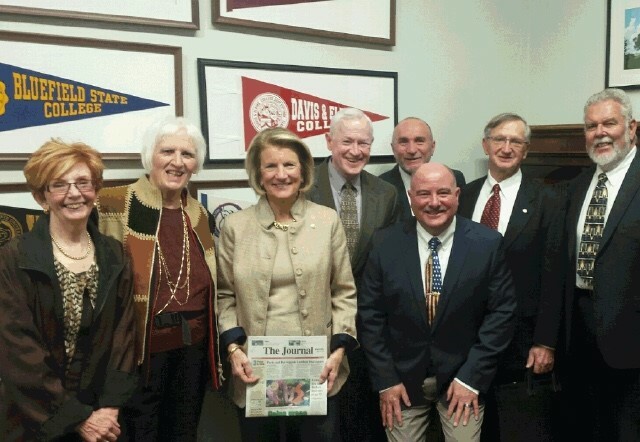 The Coalition for the Delaware River Watershed simultaneously scheduled meetings with the entire congressional delegation that represents the Delaware watershed. Although the snowstorm disrupted several meetings, the tenor of those that did take place was overwhelmingly positive with congressional members pledging to champion the Delaware on Capitol Hill. The result of Coalition’s two days on the Hill was a clear message to Members: fund the Delaware River Basin Conservation Act and its associated grant program the Delaware River Basin Restoration Program (DRBRP), a non-regulatory approach led by the US Fish and Wildlife Service. On March 23, the program received $5 million in funding as part of the fiscal year 2018 Omnibus spending bill approved by Congress. The Coalition for the Delaware River Watershed worked with Congress on the authorization of the Delaware River Basin Conservation Act in December 2016 that created the DRBRP, and through the newly funded program, money will finally begin flowing to local conservation projects throughout the region. The result of months of collaboration and hard work paid off with the rejection by Congress of Trump’s fiscal year 2018 budget proposal, which aimed to zero out the Chesapeake Bay Program. The spending bill that passed includes a fully funded Chesapeake Bay budget of $73 million and $5 million for the Delaware River. We owe a huge thank you to all of the members of Congress who voted in support of protecting the Chesapeake Bay and the Delaware River. The fight for clean water continues as the president’s proposed FY19 budget has only $7.3 million allocated for the Chesapeake Bay and nothing for the Delaware River. In May 2017, the President signed the Consolidated Appropriations Act 2017, which designates $73 million in funding for the Chesapeake Bay Program. This comes on the heels of the release of the President’s proposed budget for fiscal year 2018, which recommended a complete defunding and shutdown of the Chesapeake Bay restoration effort. 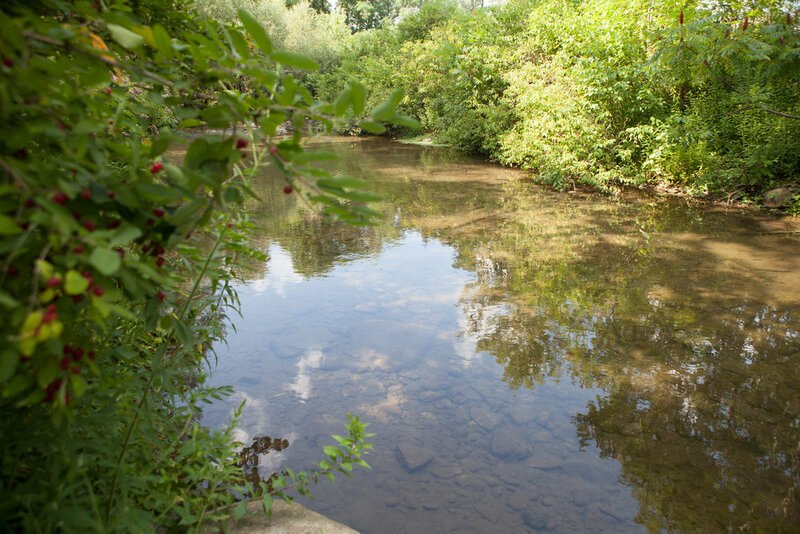 For the past eight years, the Choose Clean Water Coalition, a nonprofit organization made up of over 225 local, state, and national groups from all six states in the Chesapeake watershed and the District of Columbia, has worked with members of Congress to help secure this essential funding for the Chesapeake Bay clean up. In early April, the Coalition met with members of Congress to discuss how important the funding is for not only the Chesapeake Bay, but local communities around the watershed. Two thirds of the $73 million that the Program receives goes directly to support state and local level projects in the watershed states. In 2016, Virginia, Maryland and Pennsylvania received more than $10 million each, funding projects that include planting trees, creating habitat, reducing pollution from agriculture, and increasing crab and oyster populations. The Coalition is now focusing on fighting the proposed budget cuts for fiscal year 2018 and will continue to work with members of Congress to secure the funding necessary to protect and restore the Chesapeake Bay and its rivers and streams. 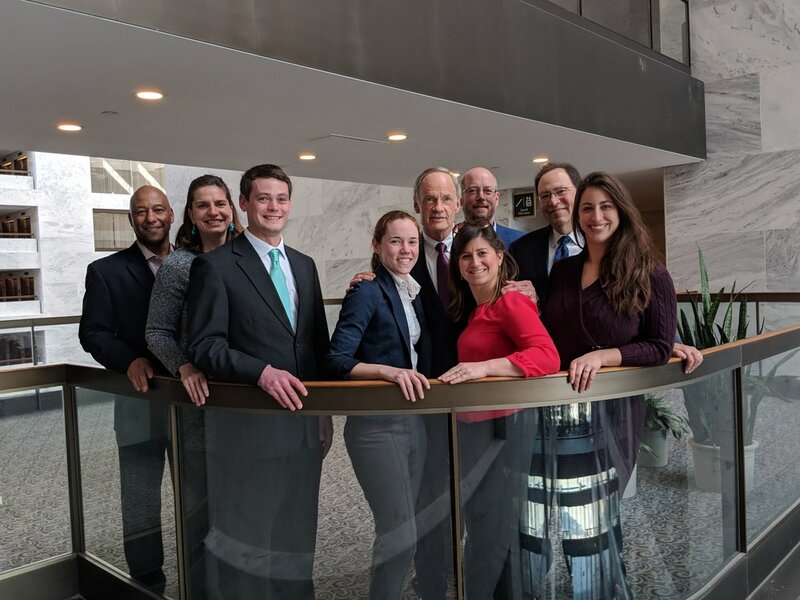 On April 5, the Choose Clean Water Coalition met with Members of Congress to discuss concerns surrounding funding for the Chesapeake Bay restoration effort. Specifically, the Coalition, a nonprofit organization made up of over 225 local, state, and national groups from all six states in the Chesapeake watershed and the District of Columbia, talked with their members and staff about the impact of eliminating $73 million in funding for the Chesapeake Bay Program on local restoration efforts. Last month, the President released his proposed budget for Fiscal Year 2018, which recommended that funding for the U.S. Environmental Protection Agency’s Chesapeake Bay Program be eliminated. The majority of this funding, over $45 million, is granted back to Bay watershed state and local communities to support local on the ground restoration efforts. Without this funding support, projects that nonprofits, municipalities, and states are implementing to improve their local communities will end. Funding for the Chesapeake Bay has historically found support from both sides of the aisle, with Republicans and Democrats recognizing the importance of Bay funding for improving local communities, and their rivers and streams. Most recently, members of both the House and Senate have sent letters of support for funding the Chesapeake Bay Program to the White House and Congressional funding committees. Moving forward, the Coalition will work to continue to push back on the President’s proposed budget, and secure the essential funding that is necessary to return clean water to the Chesapeake Bay. In March 2017, a number of successes came out of Maryland’s state legislature, including a ban on hydraulic fracturing. The ban to protect the precious Marcellus Shale formation, local waterways, and drinking water in the Western part of the state had overwhelming, bipartisan support and Maryland’s Republican Governor, Larry Hogan, signed and passed the ban into law noting that, “Protecting our natural clean water supply and natural resources is critically important to Marylanders, and we simply cannot allow the door to open for fracking in our state”. Maryland and New York are the only two states that have banned fracking in the Chesapeake Bay watershed. The threat of natural gas development within the Bay watershed has been a long contested debate. For the last nine years, the Coalition’s Shale Workgroup has pushed back at the local, state, and regional level to champion precedent setting policies to address the impacts of shale gas drilling. The significance of this historic ban speaks volumes to the work of Coalition members, specifically in Western Maryland. Efforts on the ground in favor of Maryland’s fracking ban legislation was seen from 37 diverse Coalition members, including faith groups, sportsmen, and conservation non-profits. Strong support was vocalized through a series of sign-on letters addressed to Governor Hogan and six state legislators whose districts would be impacted by fracked natural gas. Maryland’s ban on fracking is not just a huge victory for one portion of the Chesapeake watershed, it will also protect drinking water for tens of thousands of people and species of wildlife. This victory signifies the importance of collaboration and working together. Each member of the Choose Clean Water Coalition -no matter how big or small- plays a key role in protecting the Chesapeake. The ban serves as a Coalition win and demonstrates the power of our ability to provide capacity to our members and drive strategic action for the protection of our natural resources. Mariah Davis is the field manager for the Choose Clean Water Coalition. On October 15th, alongside a mud-banked river usually empty of life, little children skip among brightly tented booths, carrying fishing lines and nature-inspired passport books. Community members watch water run clear through a root-planting demonstration or try to spot American eels in a cloudy-water tank teeming with fish. In the air, marimba music and the tantalizing smells of Latin fare mingle with the musical murmur of combined Spanish and English conversations. A few feet away, a paper mural of insects is constantly expanded as everyone tries their hand at drawing local bugs. This is the Festival del Rio Anacostia, and it’s impossible to decide whether you are at an environmental event or a cultural celebration. That perfect fusion is certainly true for Ricardo, an English-speaking local resident who heard about the event through a Spanish-scripted Facebook post. Recognizing the word “festival,” he thought it’d be a nice way to spend an afternoon and enjoy some good food. Not until arriving did he realize the festival was heavy with nature awareness. “That’s good!” he exclaims. “We have to live in it. Anything we can do to make it better for me, for you, for the younger generation coming up, you know… be a participant. You learn and take it back to your own neighborhood.” He planned to take pictures and share them with people in his neighborhood that couldn’t make it that day—allowing them to witness the good food, dancing and environmental lessons alike. Coming together and collaboration were evident in the creation of the festival as much as the event itself. It began as an idea of the Latino Outreach Subcommittee of the Anacostia Watershed Citizens Advisory Committee. Before long, a diverse array of government bodies, citizen committees and environmental organizations offered their capacities and expertise. The space at Bladensburg Park was donated, along with the tents and chairs. Music was provided by Guate Marimba and entertainment by Despertar Maya Ma’am in conjunction with Asociacion de Guatemaltecos Sin Fronteras. Parks and Recreation Maryland-National Capital Park and Planning Commission, Anacostia Watershed Society, Chispa, Metropolitan Washington Council of Governments, Interstate Commission on the Potomac River Basin, Friends of Sligo Creek, Chesapeake Bay Trust and Anacostia Riverkeepers were all heavily involved in making the festival a reality. Indeed it does, and plans are already underway for a Festival del Rio Anacostia 2017. For more information or to get involved with next year’s festival, contact rpcalvo@mdlcv.org. This is a big deal! A small portion of these funds had already been announced and disseminated (e.g., $3 million of EPA money announced by NFWF in August at their Chesapeake Stewardship Grants press conference), but these very targeted funds are critical to pick up the pace on agricultural lands in south central PA. The Coalition has been very active all year trying to obtain additional funds for agriculture in PA, working with various Members of the House and Senate, meeting with officials at the Council on Environmental Quality in the Executive Office of the President, OMB, USDA and EPA. More than 100 attended the inaugural Taking Nature Black: An Audubon Naturalist Society (ANS) Black History Month Celebration, Saturday, February 20, 2016. The day-long event was held at ANS headquarters, Woodend Nature Sanctuary, and began with a Green Jobs Fair. Twenty environmental industry employers participated including Chesapeake Bay Foundation, Department of Recreation and Parks Baltimore City, National Aquarium, National Wildlife Federation, Blue Water Baltimore and Natural Resources Defense Council. College students, retirees and professionals of color came to the Taking Nature Black event for the Green Jobs Fair, to find short-term and long-term paid and volunteer opportunities. The Chesapeake Bay Program’s Diversity Action Team, an event partner, specifically helped to produce the Green Jobs Fair. Choose Clean Water Coalition and M-NCPPC, Montgomery Parks also partnered with ANS on Taking Nature Black. Chesapeake Bay Foundation and Seaberry Design & Communications were event sponsors. Breakout sessions on environmental advocacy, cultural competency and stewardship practices at home or in local communities were also part of the day’s draw. Speakers for the Environmental Advocacy Panel & Listening Session included Vernice Miller-Travis, Vice Chair of the Maryland State Commission on Environmental Justice and Sustainable Communities, member of the US Environmental Protection Agency National Environmental Justice Advisory Council and member of the DMV Environmental Justice Coalition; Irv Sheffey, Environmental Professionals of Color; and ANS’s Conservation Program Director Diane Cameron. The panel held a spirited discussion on the environmental issues facing African American/Black communities. Judy Cohall, Senior Training Manager, M-NCPPC, Montgomery Parks; Whitney Tome, Director of Diversity and Inclusion, National Parks Conservation Association (NPCA); and Nataki Kambon, Spokesperson, LetsBuyBlack365.com Black Economic Empowerment Movement delivered the session on cultural competency, Working While Black in a Green Industry. Mayor Jacqueline Goodall, Town of Forest Heights; Dennis Chestnut, Executive Director, Groundwork Anacostia; and Alan Spears, Director of Cultural Resources, Government Affairs, NPCA talked to attendees about Keeping it Green at Home. The group shared best practice stewardship tips and information on the importance of protecting nature in local, regional and national parks. “Taking Nature Black is a unique opportunity for students, community members, and professionals to come-together and learn about environmental issues impacting our neighborhoods. This is a time for us to build relationships with one another, increase our cultural competence, and celebrate a month dedicated to fairness, equity, and inclusion. Choose Clean Water Coalition is excited to partner on Audubon Naturalist Society’s first-ever Black History Month event,” said Jill Witkowski Heaps, Director, Choose Clean Water Coalition. The day’s keynote address, Green Stories in Black, was delivered by Bob “The Griot” Smith, Storyteller/Actor and President of the Griots’ Circle of Maryland, National Association of Black Storytellers. Bob inspired and entertained. An onsite display, Black In Nature: Then & Now, featured African American/Black pioneers who have made and are making contributions to nature and the environment. This display featured images and biographic information for: John James Audubon, Sophia Danenberg, John Francis, Reverend Josiah Henson, Lisa Jackson, Frank and Audrey Peterman, Fred Tutman and Michael Twitty. ANS provided a light breakfast, lunch and cocktail party reception to event attendees. The catering was done by Uprising Muffin Company and Woodland’s Vegan Bistro. Taking Nature Black will return in February 2018! To partner, sponsor, or for more information, please contact conference chair Caroline Brewer at caroline.brewer@anshome.org. As you enter the beautiful state of Virginia, you will often pass a sign reading “Virginia is for lovers.” This slogan is the Virginia motto; and it’s awesome. But, what else is Virginia for? What do these “lovers” love? Well, Virginians love clean water and we have the numbers to prove it. In 2015, the Coalition, its members, and environmental organizations across the country worked to ensure adoption of the the Clean Water Rule. This rule is necessary to protect streams and wetlands and keep pollution out of water that Americans rely on for drinking, swimming, and fishing. Shortly after the rule was adopted by the Environmental Protection Agency and Army Corps of Engineers, it came under attack in Congress. We needed to target decision-makers to ensure this vital rule was not rolled back and our most vulnerable streams remained protected. To be successful, we needed to influence Members of Congress in the Chesapeake Bay watershed, build broad support for clean water, and ask them to resist attacks on the Clean Water Rule and other federal clean water protections. We started this work in Virginia. The Coalition and the Hatcher Group launched a 4-week campaign to inform and reassure Senator Mark Warner (D-VA), a long-time clean water champion, of the widespread support Virginians have for the Clean Water Rule, and to encourage him to stand against any weakening of its protections. The goal was to flood social media with a steady drip of posts resulting in a deluge of messaging that could not be ignored. The campaign included a series of four broad themes on Facebook and on Twitter: (1) Beer and Wine; (2) Families and Pets; (3) Virginia Pride and Heritage (landmarks/waterways); (4) Wildlife (sportsmen and recreation). Weekly social media toolkits and shareable graphics were distributed to the Choose Clean Water Coalition members. The campaign used various calls to action including: “Take a photo of how you and/or your family enjoy clean water, and post it using #CleanWaterLovers.” This call to action was included as one option among several suggested posts each week. Overall participation in the campaign on Twitter was extremely high, with a total reach of more than 1.1 million accounts and a total exposure of more than 2.4 million! Facebook received even more engagement and reach. Most importantly, this campaign gave constituents the ability to engage their Senator through social media and, in the end, Senator Warner stood up for the Clean Water Rule! We encourage everyone to thank their member of Congress for protecting clean water. In an effort to continue to increase diversity, equity, and inclusion across the Chesapeake Bay watershed, the Coalition created the first diversity toolkit. The toolkit is designed to help organizations increase their own diversity through thoughtful and deliberate focus and intention. For more information, please contact Chante Coleman. In 2015, the Coalition launched its Environmental Justice Workgroup. This group was created in order to provide Coalition members with a space to collaborate and organize around issues relating to equity in the Chesapeake Bay watershed. You can learn more about the workgroup here. In 2015, the Coalition helped to secure $73 million in federal funding for the Chesapeake Bay Program - the most that the program has ever received. $12 million of the $73 million in fundsing was also designated for Nutrient Reduction and Small Watershed grant programs that provide support for on the ground restoration work around the watershed. In partnership with Interfaith Partners for the Chesapeake, the Coalition worked to highlight the importance of faith-based communities in our restoration effort.